To protect the best interests of students receiving Federal Title IV financial aid, the U.S. Department of Education published new cash management regulations (34CFR668.161-167) via the Federal Register on October 30, 2015. These Program and Integrity Rules require the University of Kentucky to maintain, account, and disburse Federal Title IV funds in accordance with these regulations. This includes refunding credit balances associated with Federal Title IV funds. This webpage is published to comply with these regulatory reporting requirements. Students are provided the choice to have any overpayment of charges which results in a credit balance deposited into their bank checking account or to have a refund check mailed to them. For more information about the refund process, click here. The University of Kentucky (UK) entered into agreements with PNC Bank on May 1, 2016, and with the University of Kentucky Federal Credit Union (UKFCU) on August 4, 2016. These agreements do NOT include services for handling student related Title IV credit balance refunds. However, since many UK students bank with PNC and UKFCU, the U.S. Department of Education requires that UK publish their contracts for public review. Links to the contracts are provided below. 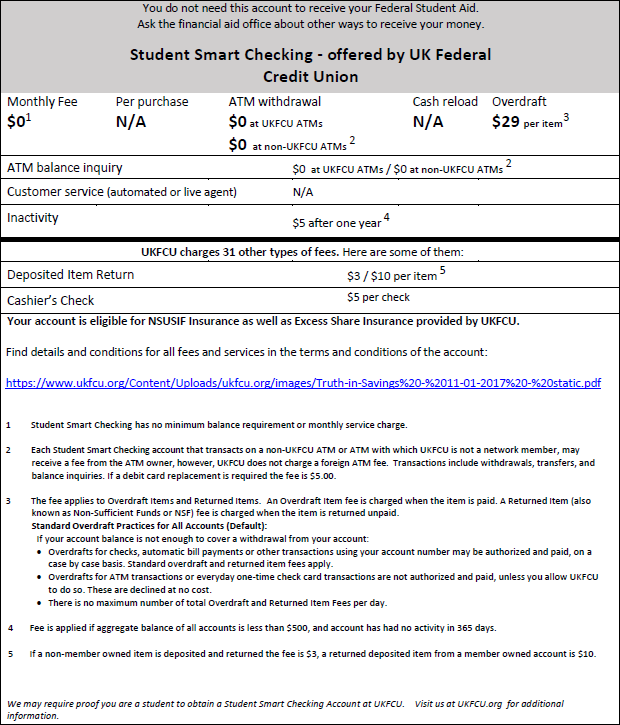 As noted above, UK has agreements with PNC Bank and UK Federal Credit Union and therefore is required to list major features and commonly assessed fees for the student accounts at each institution, as seen in the two charts shown below (for a larger, clearer version, please click on each chart). 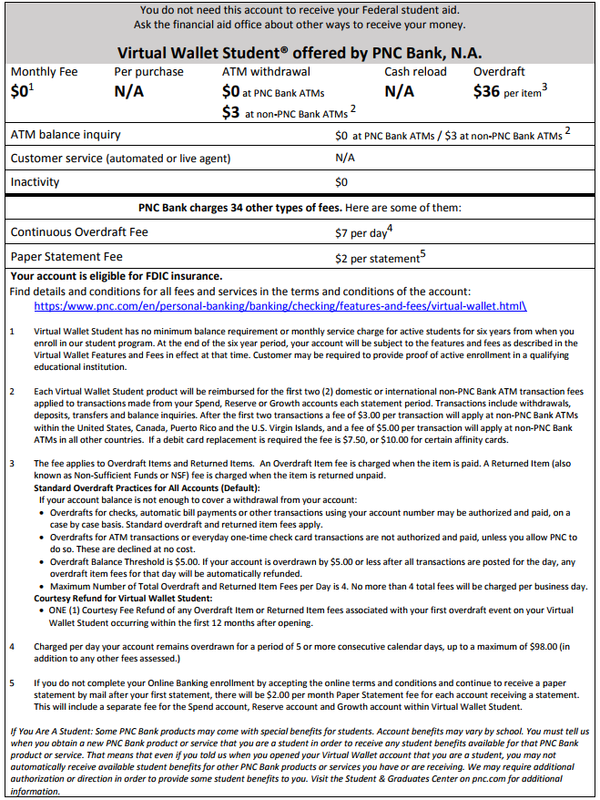 Additionally, here are links to the PNC Virtual Wallet Fee Sheet and the UKFCU Fee Sheet, as listed in the charts below. NOTE: All disclosures relating to these new regulations and the banking service contract will be made to this webpage. Students are NOT REQUIRED to have a bank account with PNC or UKFCU to receive their refund via direct deposit (ACH). UK students may use their existing checking accounts. UK encourages students without checking accounts to shop around to find a banking partner that fits their needs. Tips on the selection process can be found here.